Photography studios appeared in Mexico only a few years after the development of the Daguerreotype in the 1830s. As was true in Western Europe and the US, early photography in Mexico was primarily used for portraiture and documentation of specific places. After the Mexican Revolution of 1910, many Mexican artists traveled to Europe and were exposed to modernist experiments in all art media, including photography. Since that time, Mexican photography has been in the vanguard of contemporary art. Marcela Taboada is an established independent photographer who lives in Oaxaca, Mexico. 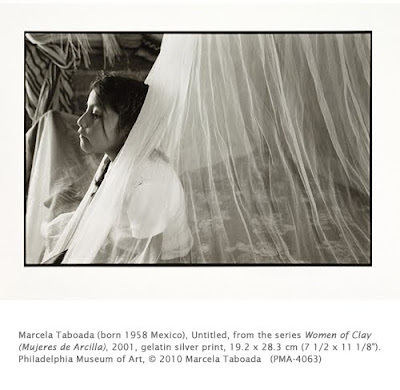 With a degree in graphic arts and design, Taboada’s photographs have appeared in various newspapers and magazines from Mexico and around the world. She has taught photography, and coordinates yearly photography workshops in Oaxaca with American photographer Mary Ellen Mark. She has won awards and stipends from institutions around the world as well. Women of Clay is a photographic series that chronicles the lives of the women of the small Indian town of San Miguel Amatitlán, in the southern Mexican state of Oaxaca. It belongs to the Mixteca Baja people. The town is high in the Sierra Madre Mountains, where water only lasts about four months a year and must be carried from great distances for basic needs. The women of the town build their own houses, using the water to make clay bricks. In order to support themselves, the women sew footballs. Taboada hopes that by focusing on the character of these hard-working women, it will open the door to possibilities of even greater help in their daily lives.